Paraphrasing Isaac Asimov, scientific progress is announced not so much by "Eureka!" than by "Hm, this is odd!" The newly discovered planetary system HIP 65426 is a case in point: With a central star in ultrafast rotation, the absence of a gas disk one would have expected for a system 14 million years old and a comparatively light, distant planet, the system doesn't quite fit the existing models for how planetary systems come into being. Planets are formed in gigantic disks of gas and dust that surround young stars. In the young planetary systems that have been found so far, including all of those observed with the SPHERE instrument, remnants of the disk are usually still visible. There is some degree of correlation in mass: massive stars tend to have more massive disks, forming more massive planets. Enter HIP 65426b, a planet newly discovered by a group of astronomers that includes researchers from the Max Planck Institute for Astronomy (MPIA), and its host system. HIP 65426b was discovered with the SPHERE instrument at the Very Large Telescope at ESO's Paranal Observatory in Chile, which took a direct image of the planet. The central star, HIP 65426, is part of what might be termed a stellar kindergarten: the Scorpius-Centaurus association which contains between 3000 and 5000 stars that formed at approximately the same time, at a distance of almost 400 light-years from Earth. Applying common astronomical techniques for dating stars both to HIP 65426 individually and to its stellar neighbors, it follows that HIP 65426 is only about 14 million years old. Gael Chauvin of the University of Grenoble and the University of Chile, the lead author of the study, says: "We would expect a planetary system this young to still have a disk of dust, which could show up in observations. HIP 65426 does not have such a disk known for the moment – a first indication that this system doesn't quite fit our classical models of planetary formation." Last but not least, the host star HIP 65426 is special, as well: According to spectra taken with ESO's HARPS spectrograph, it rotates about 150 times as fast as the Sun. There is only one other star of similar type that is rotating as fast, and that one is part of a binary star system. In such a system, matter transfer from one star to the other can spin up the receiving star. How a single star could have sped up that much requires an explanation. The origin of HIP 654426b: a system-wide drama? So far, the astronomers can only speculate about the origin of the newly discovered system's peculiar properties. A possible scenario involves a regular planetary-scale drama: Initially, HIP 65426b would have formed much closer to the star (explaining its comparatively low mass), and at least one other massive body would have formed as well. At some point, HIP 65426b and that other body would have come close enough for HIP 65426b to be catapulted outwards (up to its current great distance) and the other body moving inwards and merging with the star (causing the star's rapid rotation). The planets traversing the system could also have destabilized the disk, explaining why it did not survive long enough to be observed. An alternative explanation would involve particular dynamics of the protoplanetary disk, with both the star and the planet forming by collapse at the same time by fragmentation – which would still require an explanation for why the disk was so short-lived to have vanished by now. More definite explanations will have to wait for additional observations and simulations. They could have an impact on our understanding of how gas giants form, evolve, and possibly migrate, in general. This, in turn, is crucial for understanding the formation of planetary systems as a whole: the mass of the host star aside, most of the mass in a planetary system is carried by such giant planets, and the presence and properties of such planets has a decisive influence on the formation of their smaller cousins, such as Earth-like planets or Super-Earths. For the SPHERE team, the discovery holds an additional special significance. 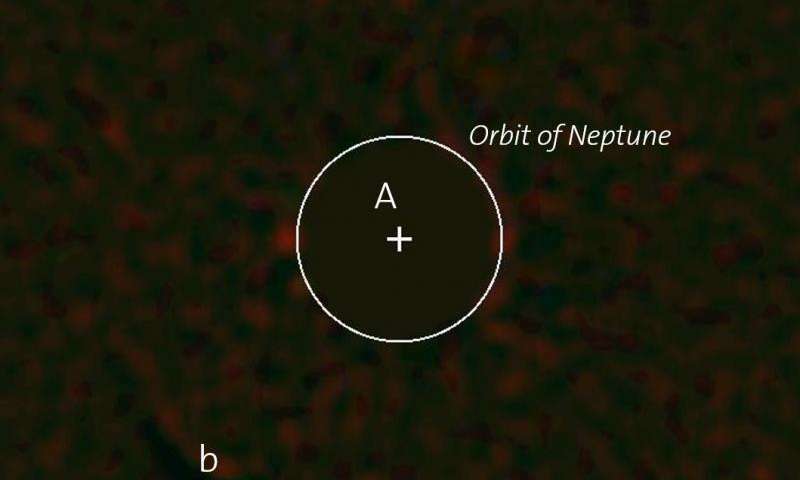 This is the first planet discovered using the SPHERE instrument. MPIA director Thomas Henning, who is one of the fathers of the SPHERE instrument and a co-author of the present study, adds: "Direct images of exoplanets are still very rare, but they contain a wealth of information about planets such as HIP 65426b. The analysis of the direct light of the planet allows us to constrain the composition of the planet's atmosphere with great confidence. " Images exist for less than 20 of the currently known 3600 exoplanets; the common methods of detection are all indirect, relying as they do on how the presence of a planet influences the host star's light. Direct imaging is very difficult, given that stars are so bright their light drowns out any light from surrounding planets. SPHERE has been designed to optimally suppress the stars' light, allowing for images and spectra of surrounding planets. So far, direct imaging is the only way to detect planets whose distance from their host star is large – planets such as the unusual HIP 65426b.